NEW YORK, September 12, 2018 /3BL Media/ — Today, the United Nations Global Compact launched a new digital learning platform to help companies become more sustainable. The UN Global Compact Academy is designed to provide businesses with the knowledge and skills they need to meet their sustainability objectives, mitigate business risks and achieve long-term growth by contributing to the 2030 Agenda for Sustainable Development. 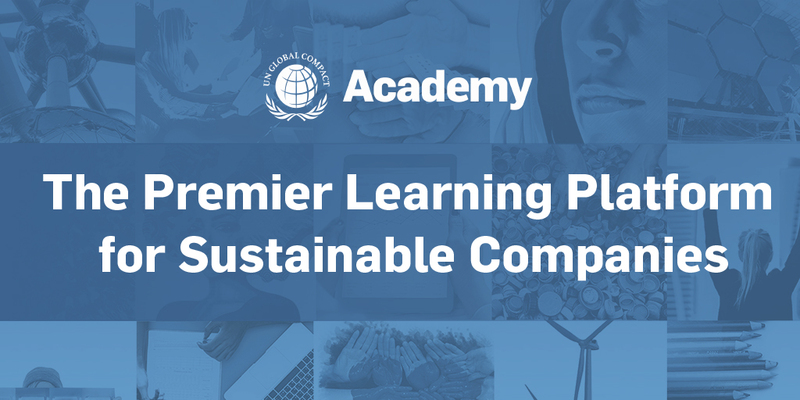 The UN Global Compact Academy delivers an engaging learning experience focusing on the issues that matter the most to sustainable companies. It gives participants access to expert-led and interactive how-to sessions, e-learning courses and a global community of sustainable businesses. Users will be able to access on-demand learning resources and measure their progress. The sessions provide practical guidance for companies on aligning their business strategies and operations with the Ten Principles of the UN Global Compact and the Global Goals. The Academy features a new interactive e-learning course that helps companies understand and take action on the Global Goals. Available to companies engaging with the UN Global Compact at the Participant level, the UN Global Compact Academy is complemented by a publicly-available influencer series, which started earlier this year with special sessions with former UN High Commissioner for Human Rights Zeid Ra'ad Al Hussein, Professor John Ruggie of the John F. Kennedy School of Government at Harvard University and Guy Ryder, Director-General of the International Labour Organization. To learn more about the Academy and how to join, click here. For a first look, visit the new platform. For more information, follow @globalcompact on social media and visit our website at www.unglobalcompact.org.